Note: The publisher provided a paperbook copy in exchange for an honest review. My Review: The Lake House was a book I looked forward to reading and I wasn't disappointed. The story moves back in forth in time and tells the tale of two main characters, Victoria and Heather. Victoria is an elderly ex-actress who returns to her hometown after experiencing great tragedy in her life. Heather is a twenty-something travel columnist who buys a home in the close-knit community because the lake house brings back memories of a distant childhood where she once felt safe. Both main characters are seeking redemption; both find unexpected friendship, love, and a sense of community. The story begins with Victoria, a character I immediately connected with. Her pain is so raw, so real. Victoria could bring me to tears within seconds. But, Victoria tries not to dwell on her pain. She's strong and independent, almost to a fault. In fact her strength and independence is the reason some of the Nagog residents don't trust Victoria or welcome her back with open arms. The elderly residents of Nagog aren't too happy to see Heather either. They don't want new blood in their close-knit community. They distrust youth and are convinced Heather will throw wild parties. The old men hatch a plan to sabotage Heather's home and hope to eventually drive her away. While Heather struggles to keep her career afloat, she must also battle a vindictive ex and her hostile neighbors. Only Victoria and Molly seem to welcome her. Molly... ah, one of the most pleasant surprises in this book. Molly is Victoria's best friend, the town's best cook, and an overall nurturing, kindhearted person. She's been a solid, stalwart friend to Victoria, even when she didn't deserve it. Nagog is full of well-rounded, endearing characters just like Molly--Bill, Joseph, Daniel, Thomas, Tommy, Evelyn, and even Sarah--there's so much to love about this lakefront community. 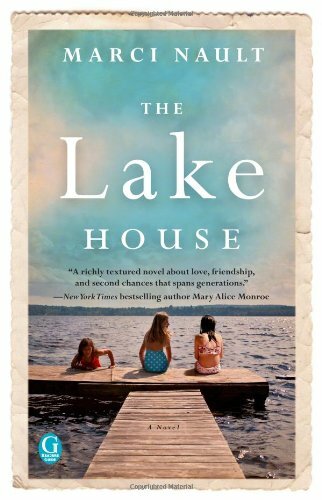 The Lake House explores the bonds of friendships, old and new; the concept of soul mates and enduring love; and the healing forgiveness brings. This is a book I'm definitely recommending to the book club I belong to. I can't wait to share it with everyone!